I’ve been frustrated lately with the food media—that is, the larger publications that (still) drive the category, not blogs or independent zines or the like. I know I’m not the only one: Tim Mazurek and Amelia Morris are two people who quickly come to mind for their thoughtful critiques of food media and culture (which are sprinkled throughout blog and Instagram posts containing excellent writing and recipes and all that other good stuff). And this isn’t really anything new for me, but my complaints right now are specific. My sense is that food publications, and the realm of food/beverage/lifestyle media more generally, are responding to a surface-level idea of what people want, and the resulting content is rather uninspiring. And also pretentious, and generally unhelpful. Case in point: the May issue of Bon Appétit focused on travel, highlighting excursions and recipes from such places as Taiwan, London, some cool city in British Columbia called Tofino and, of course, Oaxaca, the it-girl of the moment (I could focus more specifically on the problems with the current, sudden, surface-level obsession with Mexican life and culture, but I’ll save that rant for another day). This is not a terrible concept, and there were some okay articles and good recipes included in the issue. I also see the logic: people love to look at other people’s Instagram photos of travel and adventure and meals! It’s one of our favorite pastimes, isn’t it?! Yes. Sure. We like looking at pictures of other people’s beautiful lives…kind of. Except that it makes us sad and jealous and less present in our own lives. I don’t believe we’re actually looking for more: more images of gorgeous meals at hot new restaurants in cities we don’t live in, more articles about far-off destination we can’t afford to visit, another picture of a beautiful, skinny white girl with the perfect shade of lipstick holding, but not eating, a bright pink popsicle (sorry—paleta). Why not a guide to planning a stellar weekend getaway that can be adapted to any part of the world, or a 101 to road-tripping across the country, or a simple primer for traveling well in Europe? Why not offer something general that would be exciting and useful, not just “aspirational”? I think we are tired of wishing we were doing other things, living other lives, being other people. I think we actually want advice and inspiration—strike that: just a little encouragement!—for living our own lives, with our own partners and babies and friends, in the perhaps imperfect spaces in which we live, in whatever city we might call home, with the jobs we’ve got right now. I don’t want to be “inspired” if the definition of the word is, apparently, to be jealous of other people’s lives. I want to be encouraged to live my life—my imperfect, messy, confusing, technicolor, wild and wonderful, beautiful life. People actually want help packing good lunches, and coming up with an idea for dinner tonight, and making vegetables taste fantastic, and figuring out how to fit all this into a busy schedule. When I cook for friends and family, the thing I am asked about most is how I make salad dressing, and/or how I build a tasty, interesting salad. I get questions about the simplest food that I post on Instagram: grain bowls and pretty toasts and simple quick breads and the like. It’s the advice I seek as well—how did my friend Celia make that classic creamed kale at Thanksgiving, and that dreamy risotto before that, and what are her tips for assembling such perfectly satisfying spreads of appetizers and picnic provisions? How did our chefs at Good Eggs keep such staples as crème frâiche and sourdough starter brewing at all times? What’s the trick to keeping all of those lacy ends tucked into the poached egg on my restaurant toast? Why are my mom’s blueberry muffins and my grandmother’s rhubarb pies still the best I’ve had? It’s not the fancy, complicated, time-consuming stuff that’s most attractive at the end of the day, but the everyday good stuff. Let me be fair, Bon Appétit does address these questions occasionally. They have a dinner column that I think is great, and a new “Healthyish” initiative that is sometimes annoying but actually very much aligned with what and how I like to eat. And maybe what I’m envisioning is too idealistic and wouldn’t sell magazines. But in this moment of food mania, I’m keeping the bar high. I think they could do better. I think a lot of publications could. On a brighter note, I can tell you who IS doing better, and that is Samin Nosrat! Ironically enough, there’s an article about her and a crop of lovely recipes she wrote in the June issue of Bon Appétit, so good on them for that. But what I really think you should do is seek out her new cookbook, SALT FAT ACID HEAT, whether you want to learn the basics of cooking, or you are a very good cook but want to better understand the principles behind the techniques you know, or you just like clever illustrations. Samin outlines the principles behind great cooking—salt, fat, acid and heat, as you may have guessed—and she explains not just how they work but why. It’s a primer based on all she learned from years cooking at Chez Panisse and elsewhere, traveling the world and teaching these techniques to others, not least our man Michael Pollan. And Samin is a fantastic teacher, the sort who roots for you and wants you to succeed. It’s a bit of an investment to actually sit down and read this whole book, but for those who are curious about cooking or working on improving, it’s entirely worthwhile—and super charming to boot, thanks to illustrations by the very talented Wendy MacNaughton. Because Samin really does want you to learn how to cook, the book also includes lots of variations with each specific recipe. The whipped cream recipe, for example, includes a full 19 variations on that theme! It also includes fantastic tips that you’ll remember well beyond the first time you follow the specific instructions here, like putting your bowl and whisks in the freezer before you get going. 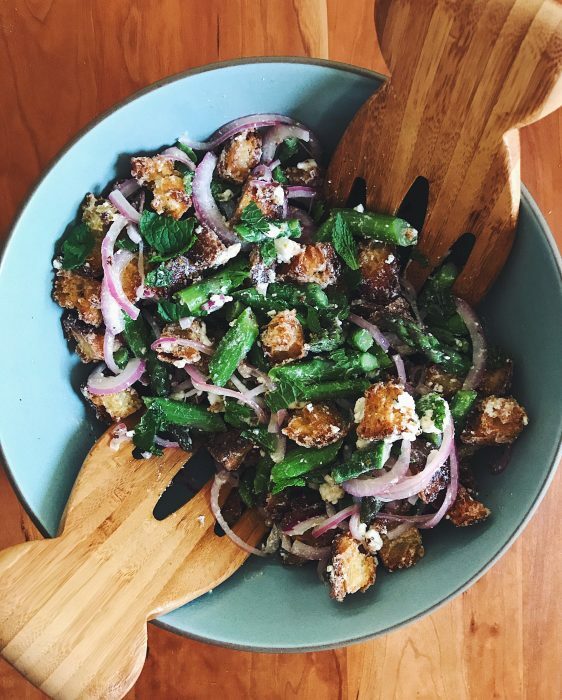 For this panzanella recipe, Samin offers an iteration for each season, which is great because we should definitely be eating panzanella beyond tomato season. The crouton recipe included here includes a cheesy variation that I tested back when the book was still in development, and those were, no joke, the most perfect croutons I’ve ever eaten. The point, though, is that this is a book about being a cook, not dreaming of cooking in another life that isn’t yours. There is a time and place for that sort of thing, I realize, and I own plenty of cookbooks that I happily flip through but don’t often use. But what I think we need now is more of this: empowerment and tips and kindness and a really good dinner. So pick this one up if you want to live your own life…with, perhaps, just slightly better food. As a start, here’s that killer salad. Set a large pot of water on to boil over high heat. Season it with salt until it tastes like the summer sea (that is a direct, wonderful quote from Samin). Line two baking sheets with parchment paper and set aside. In a small bowl, toss the sliced onion with the vinegar. Set aside and let the mixture sit for at least 20 minutes. If the asparagus is thicker than a pencil, “stripey peel” it: press lightly with a vegetable peeler, removing just the outermost skin from about 1 inch below the blossom to the base. Then, slice the asparagus on a bias into 1 1/2-inch segments. Blanch the asparagus in boiling water until it’s just tender, about 3 minutes, less if it is very thin. Taste a piece to determine doneness: it should have a faint crunch in the center. Drain and allow to cool in a single layer on the prepared baking sheets. In a large salad bowl, combine half of the croutons with about 1/3 cup of vinaigrette. Let them sit for 10 minutes. Add the remaining croutons, asparagus and macerated onions with their vinegar. Tear the mint leaves in small pieces, and add those, too. Crumble in the feta in large pieces. Dress with an additional 1/3 cup vinaigrette and seasons well with salt, then taste. Adjust the seasoning with more salt, vinaigrette and extra vinegar as needed. Toss, taste again, and serve at room temperature. A final sprinkling of feta and/or more mint leaves on top make for a pretty presentation. Preheat the oven to 400 degrees. If you want particularly tooth-friendly croutons, remove some or all of the crusts of the bread. Cut the loaf into inch-thick slices. Cut each slice into inch-wide strips. Working over a large bowl, tear each strip into inch-size pieces. You can also tear croutons directly off the loaf, but this method helps get more even but still rustic croutons. 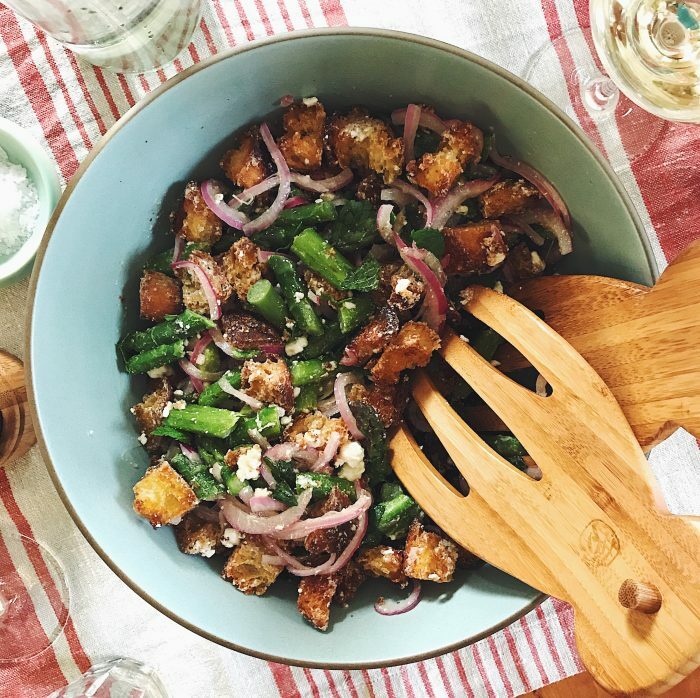 Toss the croutons with the olive oil to coat them evenly, then spread them out in a single layer on a baking sheet or two. You want them to have plenty of space so that they don’t trap steam, so an extra sheet is usually worthwhile. Toast the croutons in the oven for about 18 to 22 minutes, checking them after 8 minutes. Rotate the pans, switch their oven positions, and use a metal spatula to turn and rotate the croutons so that they brown evenly. Once they begin to brown, start checking every few minutes, continuing to rotate and turn. Bake the croutons until they’re golden brown and crunchy on the outside, with just a bit of chew on the inside. If some are done while others still need time, start removing them as you check their progress. Taste a crouton, and sprinkle the warm croutons with a pinch of salt if desired. When the croutons are done, let them cool in a single layer on the baking sheet(s). Use immediately, or keep in an airtight container for up to a few days. Refresh stale croutons in a 400-degree oven for 3 or 4 minutes. Note: That cheesy variation I mentioned? Just add 3 ounces (about 1 cup) of finely grated Parmesan and lots of coarsely ground black pepper after you toss the bread with the olive oil. Toss well, and then proceed as directed above. In a small bowl or jar, let the shallot or onion sit in the vinegar for about 15 minutes to macerate, then add the olive oil, a generous pinch of salt, and a small pinch of pepper. Stir or shake to combine, then taste and adjust salt and acid as needed. Leftovers can be kept in the refrigerator for up to 3 days. oh yes yes yes. I am slooowwwwllyyy working on another cookbook with this in mind as well. The more women I talk to in my real life, not online life, are really only concerned with how they can get dinner on the table somewhat healthfully and quick. The fuss and pretense and over creativeness is lost on most and I want to be part of the solution. Not that my recipes are those things, but I am more conscious of it now more than ever. Anyway. Your words are always so relatable. I am just starting Samin’s book and reading every page like a text book. I love it.